The 2016 Chinese New Year Fireworks and Firecrackers Roundup! It’s Chap Goh Meh today! 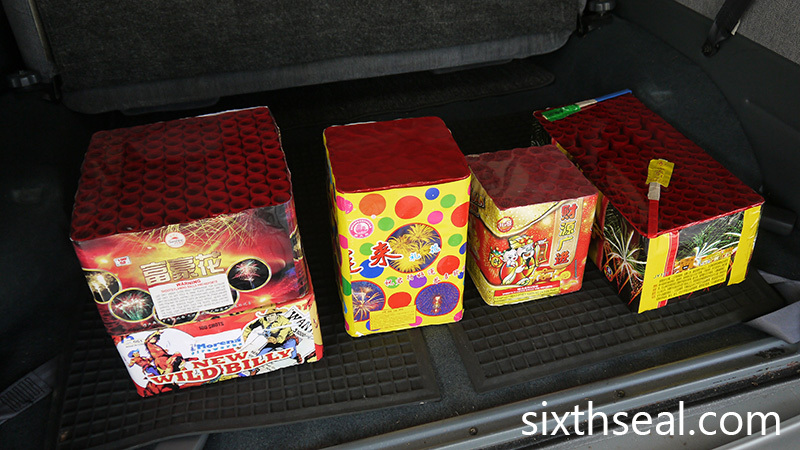 As per sixthseal.com’s custom, we’ll be doing a roundup of the wonderful fireworks and firecrackers we’ve bought this year. There were no firecrackers last year due to my mom’s passing so this year sees the return of firecrackers. I got a huge fireworks cake, it’s larger than the 2015 flagship fireworks cake in some ways. I also ordered two large 2″ fireworks cakes. These large bore shells make the cake taller than they are wide, producing a unique and beautiful format. I got this a month ahead and it was delivered to my place for safekeeping until Chinese New Year. I have 9 fireworks cakes and 3 firecrackers this year, mostly 100 shots and up. Behold! 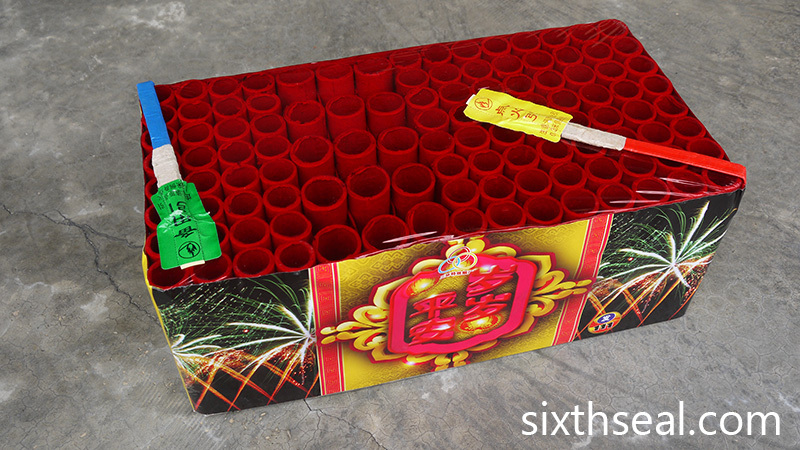 This huge fireworks cake produces a staggering 530 shots and lasts almost 5 minutes! 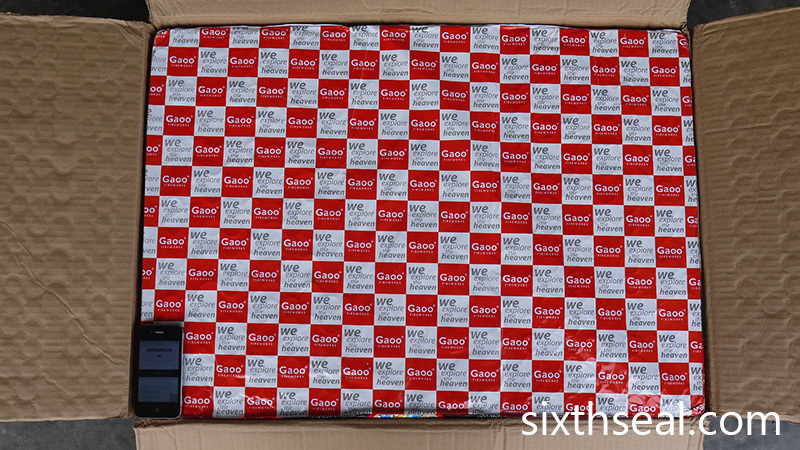 It measures a very respectable 73 cm x 52 cm x 17 cm. Here’s an iPhone for comparison. 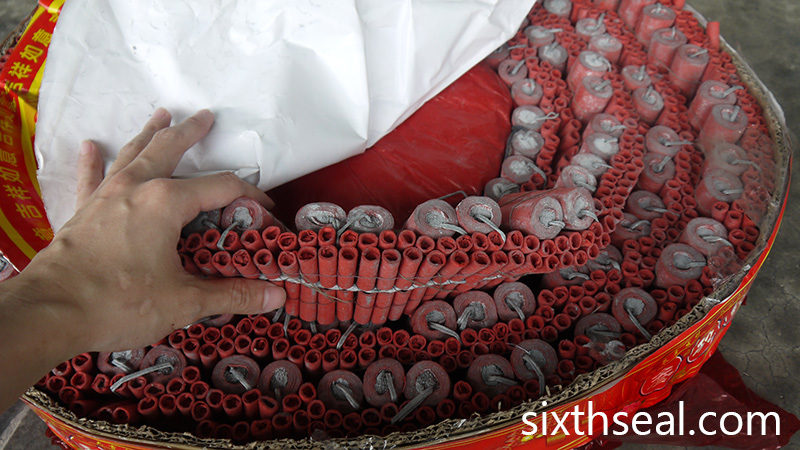 Yup, there are 530 individual mortars arranged together in this 22 kg cake that requires two people to carry. It’s made by VIP Fireworks and is the most expensive individual cake I’ve ever purchased. It just came out this year in their 2016 fireworks lineup. I’ve never even heard of a 530 shot fireworks cake before this. These things are marketed as “5-minute display-in-a-box” fireworks in the US for professionals. I waited until my sister and her family came back before I let this one off. This is my centrepiece for this year. I have another video recorded in 1080p in 60 fps which makes for a more beautiful (and smooth) viewing experience here! This large fireworks cake has an INSANE start – full sky saturation and mine effects to kick it off in intense style before the pace picks up into wonderful segues and loops till a shattering finale. Awesome stuff! I’ve always loved these large bore formats. 2″-4″ fireworks cakes tend to be taller than they are wide. 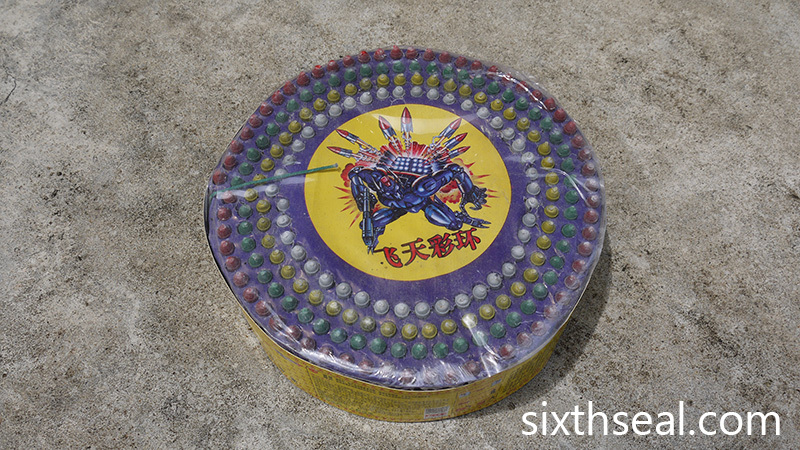 This is coz the larger shells require a longer mortar in order to fire the aerial bursts, comparatively the normal 0.8″-1.2″ fireworks cakes are quite short/shallow. These large shells produce a large burst in the sky too, which tend to be more beautiful breaks. I should note that this fireworks cake is actually a mine! Mines are ground level effects, meaning the pyrotechnics start from the ground. You can see the glitter charge shooting up from the tubes before the main break in the video. Mines are starting to be less common nowadays, I have no idea why but it seems that demand has largely ceased. It’s nice to be able to purchase a nice mine fireworks cake again…and in large format breaks too! Check out the 2″ mortar tubes. 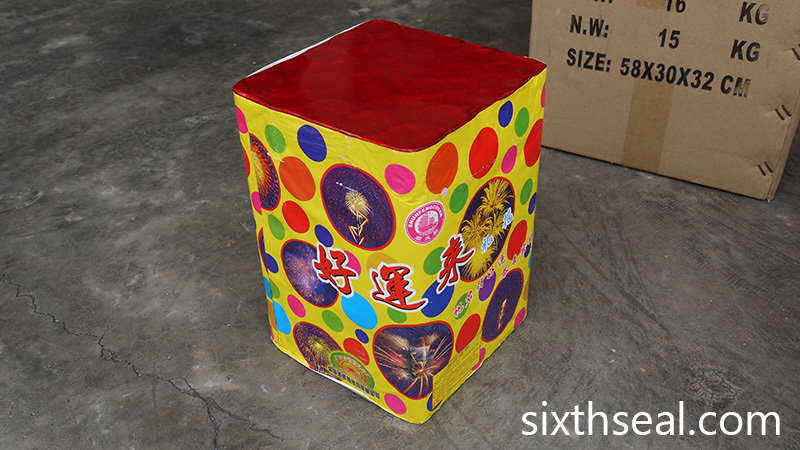 These come packed 2/1 – this means there are two fireworks cakes in one box/carton. I let one off during Chinese New Year eve and the other when my niece and nephew were back. You can view the 60 fps vertical oriented video here. I feel this is the best way to view a mine fireworks cake. 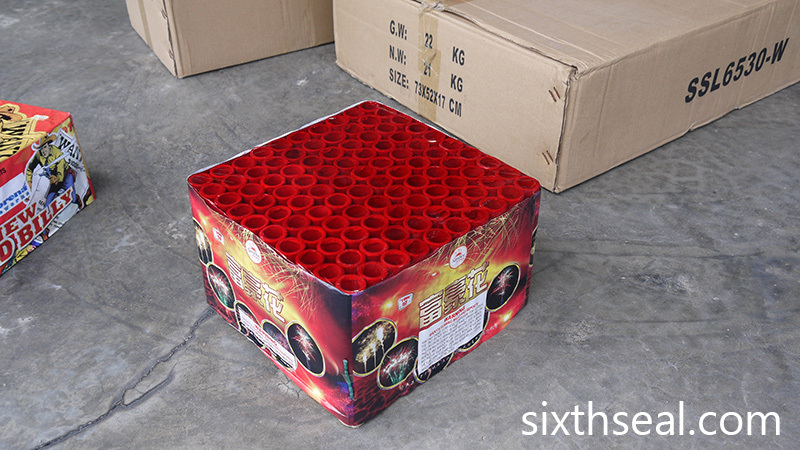 It’s 25 shots, which may sound unimpressive at first, but each shot is more than 4x the size of regular 0.8″ fireworks cake in power and effect! This is a 258 shot Saturn Missile Battery. Saturn Missiles are smaller rockets which whistles up and usually comes in 50/100-shot cakes (most common format). This larger format is round and cost RM 35. The interesting thing is that you can let this off in the day or night – it doesn’t make much of a difference. I quite like this red, green, yellow and white Saturn Missile Battery which finishes with a report. It’s not very fast, unlike some batteries, so some people may like the duration. This clocked in at almost 3 minutes from the time I lit the fuse to the end of the cake. 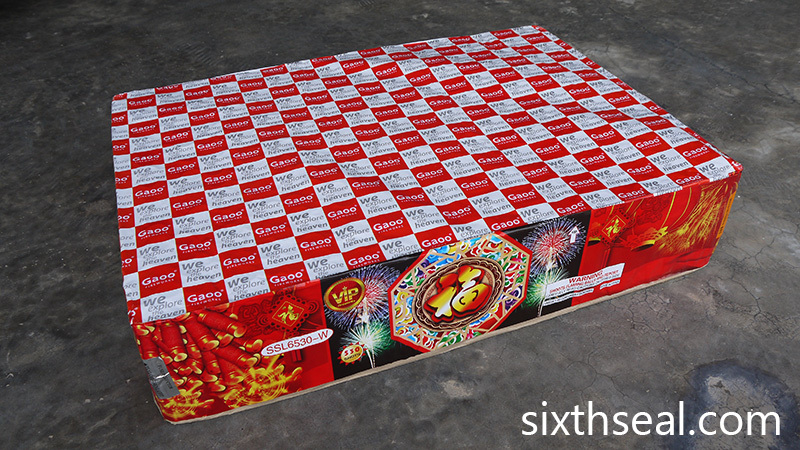 This is the largest commercial Chinese firecrackers for sale. Of course, there are larger counts e.g. 188,888 fireworks, which requires a lorry to transport and a crane to lift up before it can be lit but those are so expensive it’s usually only set off by companies, not private individuals. 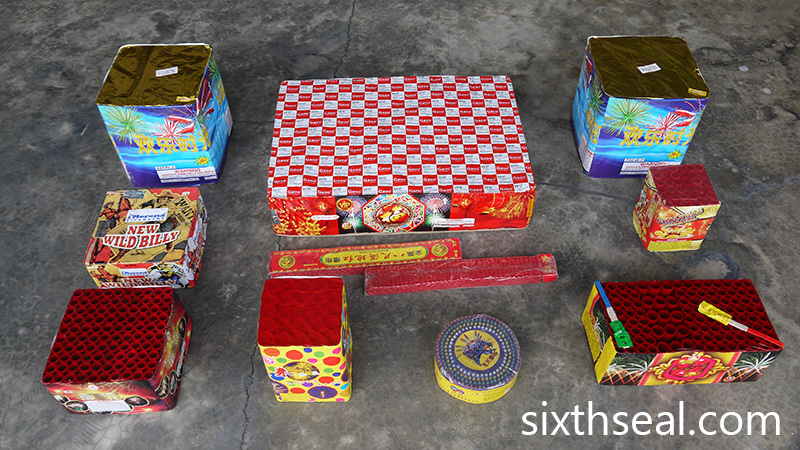 Keep in mind that these class of firecrackers are almost like salutes and are rated 1.1G – they’re very illegal! 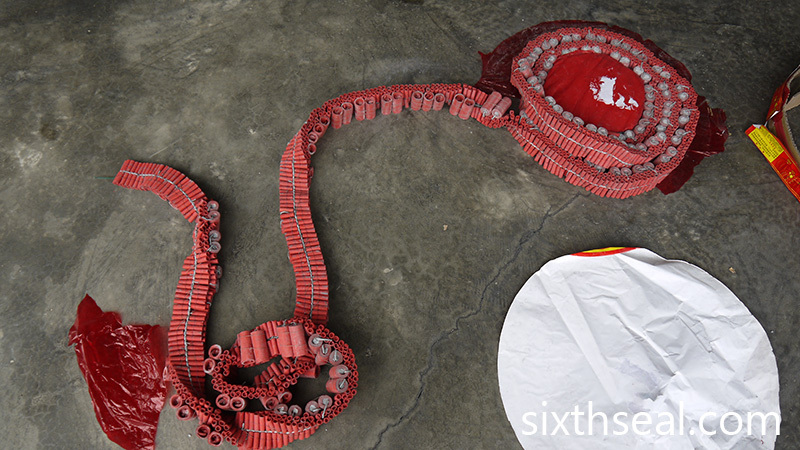 This is coz the firecrackers are very large and contains a chalk plug (which essentially makes it a salute). 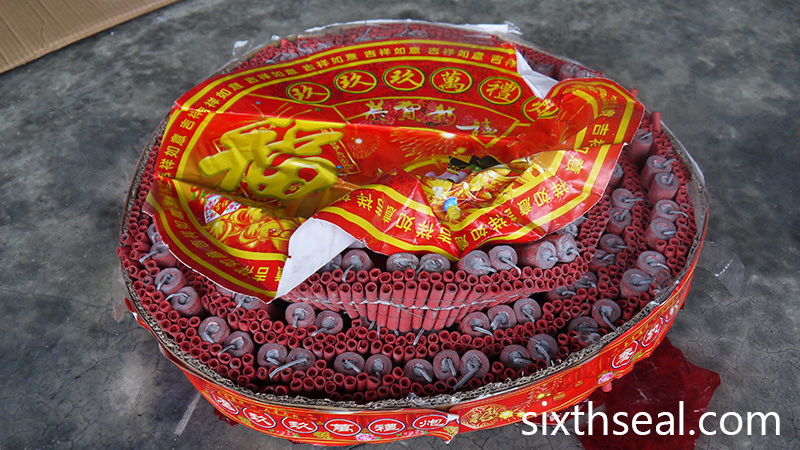 There are 39,999 individual firecrackers in this string but it’s not very long compared to the 3,000 string firecrackers coz the single firecrackers are larger and it’s stacked on top of one another for a 3-layered firecracker, making a very intense and loud burn compared to the “regular” 3,000 count firecrackers. You can see the difference here. I had to light this directly coz I lost the Visco fuse. Haha! I pulled my hand away as soon as the firecracker caught (this is more from experience than reaction, as you can see). I really like this video, give it a spin to see what the firecrackers we get in Sibu look like. 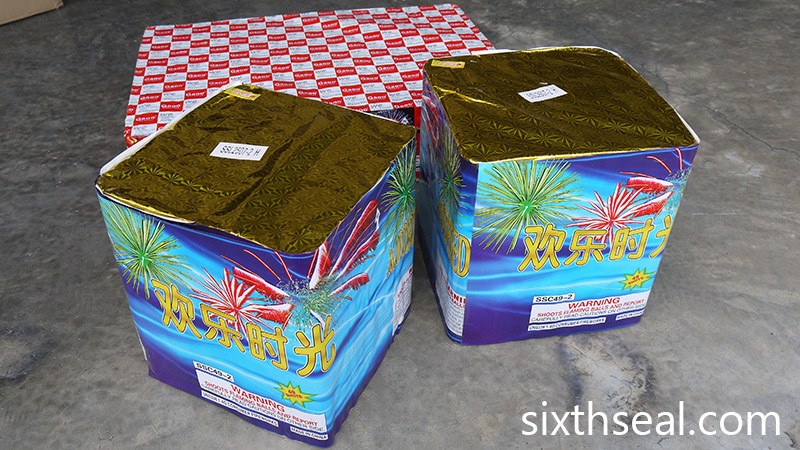 These are the “common” firecrackers which you can get in KL and even the US. 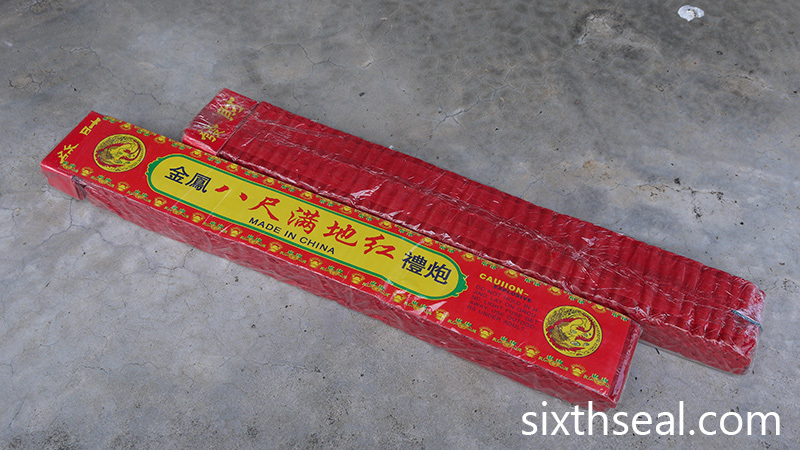 These firecrackers are a lot smaller than the previous one – they don’t break the skin if you light one in your palm/hand so they’re very safe. The “ending” is just a bunch of the same instead of the salute-like power you get in the 39,999 traditional Chinese firecrackers. I see a lot of places like KL are starting to switch to this coz they’re not as harmful (you can hold them in the hand, not to say that you should coz it’ll still burn you, but it won’t break the skin) compared to the traditional kind (as per above, the 39,999 Chinese firecrackers) which won’t be so kind to your hands and fingers. Unfortunately, they’re also not as loud or powerful so generally most people in Sibu don’t favor this kind. It’s very cheap though at RM 12.50. The 39,999 roll is more than 10x the price of these kid-friendly crackers. This is a classic fireworks cake with 36 shots. It’s been around for a while – I actually got this from a friend’s house. She had heaps of these lying around and I let it off during Chinese New Year. Unfortunately, I think it’s starting to show its age – most of the tubes didn’t go off. There were 8-9 mortars which didn’t fire. This is the 60 frames per second version. It’s really a nice old fireworks cake, this was the epitome of greatness back in the late 90’s. This is another beautiful classic fireworks cake. It’s not as impressive as the newer firework cakes with fancy breaks and effects but it’s a nice reminder of how the fireworks cakes looked 10 years ago. It’s a trip down memory lane. This is the vertical view with 60 frames per second (you can really see the difference). 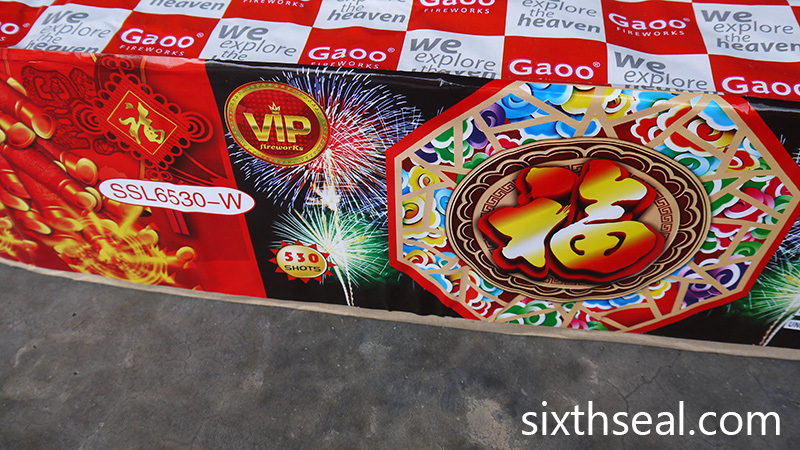 This slow tempo fireworks cake is characteristic of an older design which is less favored now. It’s still lovely to watch for sentimental reasons though. This is also a more traditional 100 shot fireworks cake. It unfortunately exploded while the last row was firing so there was a bit of a fireworks malfunction but it’s still quite beautiful to watch. It’s a classical fireworks cake that’ll give you a nice dose of nostalgia. This is the 60 fps vertical version. This is a cake by Morena Fireworks. Yup, that’s an Italian fireworks brand, much like the Jupiter Fireworks horseshoe fountain fireworks I got in KL last year. 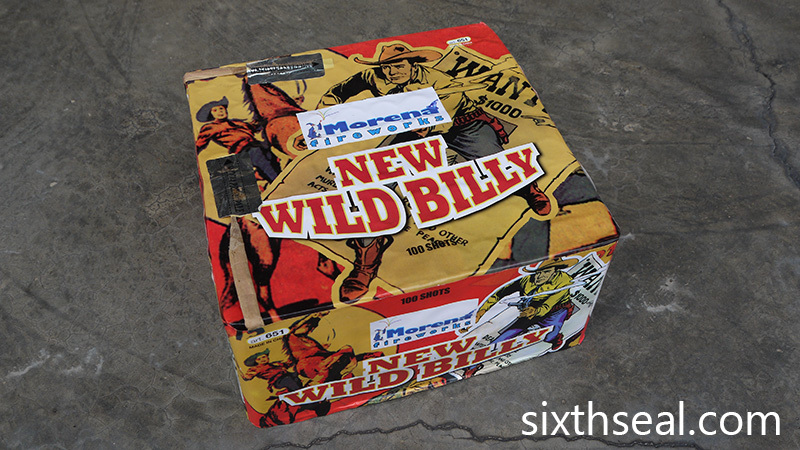 Morena Fireworks makes a lot of 100 Shot Assortments and New Wild Billy is one of them. It’s a nice example of their 100 shot fireworks shows. This is a new 2016 fireworks cake. The new cakes all have two fuses – the primary fuse and the secondary fuse. This is to make it easier to link up fireworks cakes for a show e.g. you can just use Visco fuse to run a line from the secondary fuse of a cake into the primary fuse of the second. What happens is that the primary fuse burns, the cake goes off, and the secondary fuse burns last after the cake is done so this in effect makes a cascading effect where each cake goes off in sequence. You can also run them into the primary fuse if you want them to go off together. There’s a lot of flexibility built into the new cakes and the quick match fuses (blue and red) already have a Visco end so you can just cable tie two (or more) together. Also, the effects are quite varied in one cake. There is an initial array of 8 x 8 tubes going straight up for 64 shots of effects after the primary fuse. This is followed by 3 x 5 angled tubes. The 15 fanned shots following the first set of effects are angled for complete sky coverage and it’s of a larger size than the first. This is followed by a 8 x 4 tube array for the finale which produces a 32 shot finish for a nice 111 shot cake. That’s all I have for this year! Here’s a video I made of all the bigger fireworks cakes I let off this year in Full HD 1080p 60 frames per second smooth viewing glory. Click on this one if you’re just going to watch one video, you won’t regret it. Hope you all enjoyed the fireworks and firecrackers videos and the explanations I wrote to give non-fireworks enthusiasts a glimpse into the world of pyrotechnics. Wow! I am impressed with the 39,999 Chinese firecrackers. I never know there is such a thing. I thought all firecrackers are the same. I always look forward to this post of yours. These are safer in that they won’t break your skin if they explode in your hand so people started buying this since lion dance troops prefer this type as they’re not as intense and powerful so they can dance in front of and below it, even playing with them while they can’t get anywhere near the 39,999 firecrackers one coz it’s too intense. Thanks Merryn! That nice, rolling it round the fence like that. 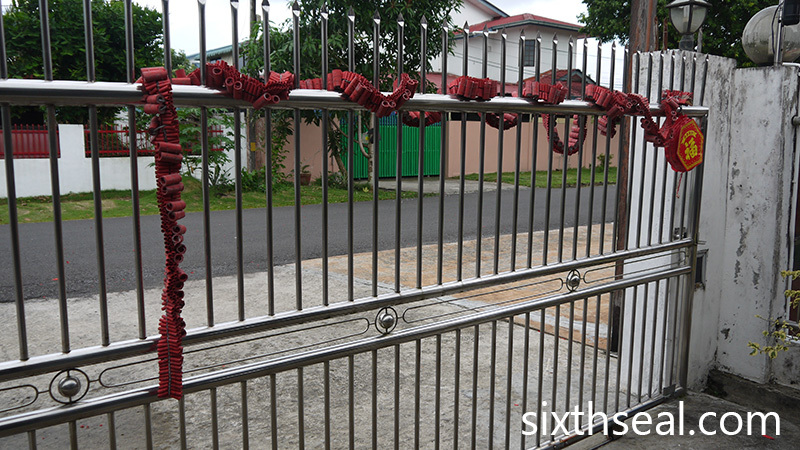 Some make something like a flagpole that doubles as a stand to hang the lanterns when not in use. I just can’t stand people hanging it on the telephone line. I’ve seen people throw it on telephone lines before. I’m not sure if it’s safe or unsafe but I don’t recommend it. It’s not meant to hold a lot of weight and may cause problems. The bigger ones are actually 30 kg+. Wow! I am flabbergasted! So many fireworks. It’s a passion of mine and I’ll allocate some $ each year that goes to this and post up all the videos on YouTube and link them on this blog. Holy molly!!! That’s a crap load of fireworks you bought man. How much money did you burn for them in total? It’s something I’ll allocate for, save a bit each month and put it here. I’ve actually stopped a lot of my vices, totally stopped smoking so ex cigarette money goes into the fireworks fund. I think they’re essentially the same concept – both burning money. Haha. 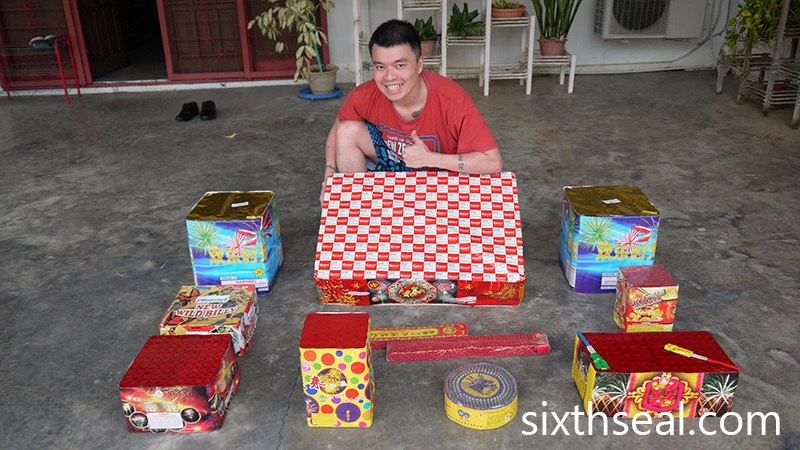 Happy Chap Goh Mei.. Aiyoyo, so many types of fireworks! They are very impressive, but I only know one type.. The long red one, people usually hang on a tree, hehe..
We have a lot of different types, some a lot bigger than the safer 3,000 firecracker version. There are firecrackers that produces lights when you light them (e.g. green, blue, red as you can see in the video) and some even have a fragrance/smell now. OMG, you guys are crazy! Hahaha! I’ve never own any fireworks in my life. Gosh, that must be so fun! It’s my passion, I love writing about them, documenting them and putting the videos up on YouTube and compiling everything on my blog. Happy Chap Goh Mei to you too! You are such a fireworks expert. I don’t know any of these. Last time they only had 1 effect and it’s just repeated throughout the cake, which was why the old name for these fireworks cakes are repeaters. Nowadays the tubes (these cakes are all made up of multiple tubes) have various effects, some tubes can have up to 7 effects! 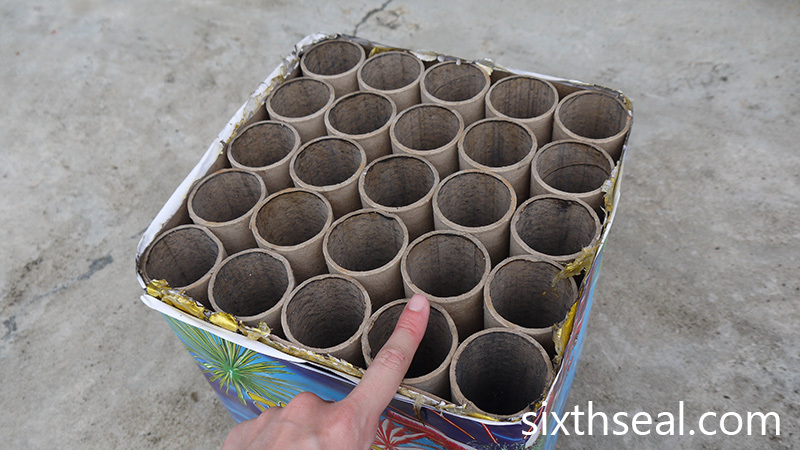 It’s my favorite thing to do each year too – purchase the fireworks, see how they work, video it and put it up on YouTube before reviewing it in a roundup post on my blog. It’s become a ritual. 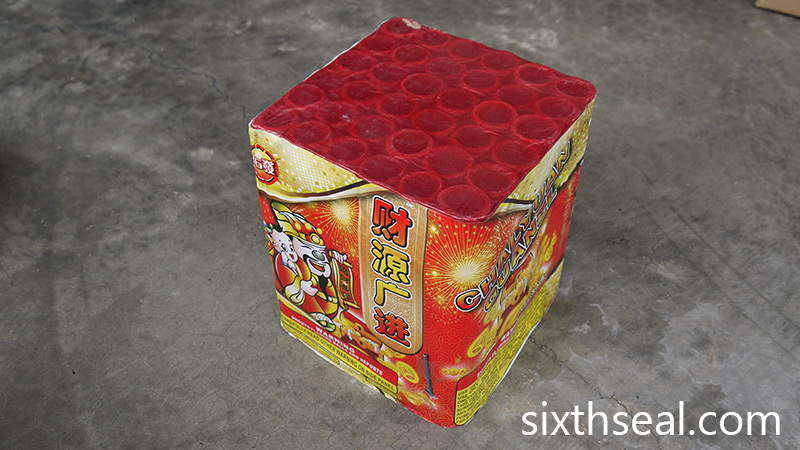 I’ve been playing with firecrackers since I was a kid, but I’ve never had as many as you had. It must have been a lot of fun firing them up! Nowadays my dad watches while I let them off. It’s a bit of a family tradition, my niece and nephew watches too (they’re based in Singapore where fireworks are illegal). I didn’t have a lot of money as a kid too so we made do with what we had, now that I have a bit more, I can afford the huge fireworks cakes that I could never buy when I was younger…not that there were cakes of this size until a few years ago. Wow, u really splurge a lot on fireworks! Next time can invite me over to watch the fire work performance, I just simply love it! The performance is during Chinese New Year every year. Let me know if you’re in Sibu and I’ll be sure to wait till you drop by before I let them off. It’s a passion of mine. I don’t spend on anything else except travel and fireworks (and stuff for my better half). I don’t buy toys, I don’t smoke now, I don’t drink now, so I have a bit extra to splurge on the things I like.